Bill owns a company that manufactures and installs car wash systems. Magic Wand Car Wash Systems just in case you want to buy one. 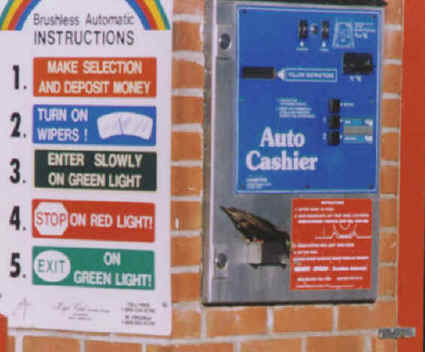 Bill's company installed a car wash system in Frederick, Md. for a gentleman. Now understand that these are a complete system including the money changer and money taking machines. The problem started when the new owner complained to Bill that he was losing significant amounts of money from his coin machines each week. He went as far as to accuse Bill's employees of having a key to the boxes and ripping him off. Bill just couldn't believe that his people would do that. So they set up a [photo] trap for the thief. Well, they caught the thief in the act! Scroll down to see the thief. 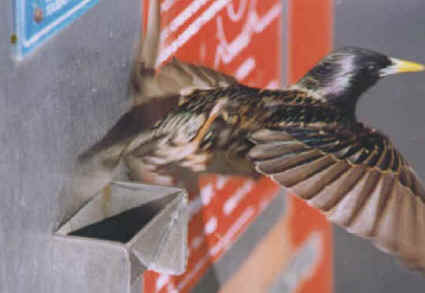 The bird had to go down in the machine and back up to get to the money! Another amazing thing Bill told us is that it was not one bird; there were several working together. Once they identified the thief, they found over $4000 in quarters on the roof of the car wash and more under a nearby tree. 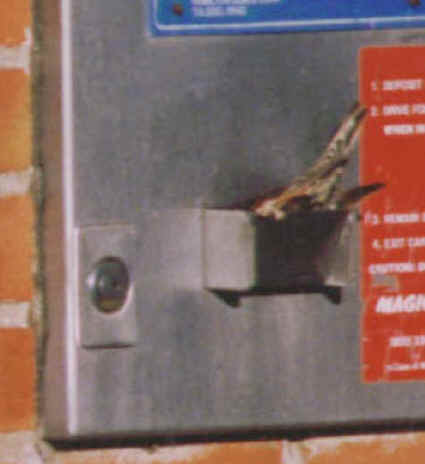 We surmise that a starling was attracted to the glint of the sun on a quarter that a person was putting into the machine, or when taking out his or her change. 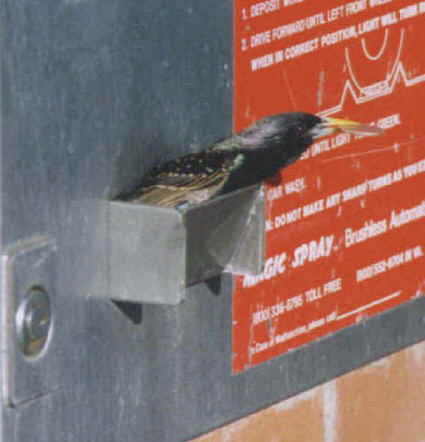 Seeing the place where the shiny objects "appeared", the starling went to investigate, and discovered that he (males seem to do this to attract a female) could remove the quarter and take it back to his nest or courting place. Not wanting to be out-romanced, other starlings learned from the original "inventive" fellow how to get "their own" quarters, which shows the intelligence and learning ability of birds. Starlings will clear out a chosen nest cavity before attempting to attract a mate through song and wing-waving. This is a male starling in the photo (noted by the blue base at the beak - a female's would be pink, no kidding), and when he is finished clearing a cavity he will sit and sing and wing-wave until a female is attracted. 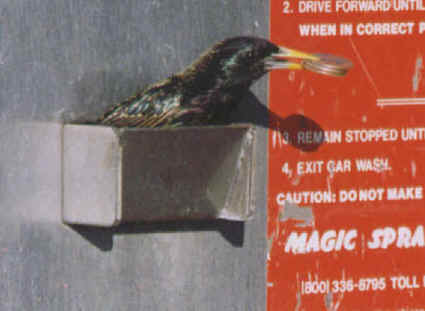 Unfortunately for this male starling, his efforts at clearing his chosen cavity were thwarted by all the customers at the car wash. :) Poor birdie. He's not a relative of the crow, magpie, jay or raven and is therefore not as attracted to colorful or shiny objects (as even the Australian Bower birds are), but instead, had found what he thought was the "perfect" nest cavity in which to raise a family. He just kept clearing it out every day and if the folks who'd caught him on camera had pointed their camera instead at a high point nearby during his "intermissions," they would have seen him sitting there singing and wing-waving. . .until the next round of "debris removal".